Supervisory Assistant of Adjustment Services for the Hamilton Board of Education, R.W. Bro. Elgie is a fourth generation Mason. His father and grandfather were Past Masters of Mt. Olivet No. 300 Thorndale. Born in Thorndale and educated in Thamesford, Ingersoll, London and McMaster University Hamilton, and University of Toronto, in 1974 he married Jayne of Alliston. He joined King Solomon No. 394 Thamesford in 1959 and affiliated with Ancient Landmarks No. 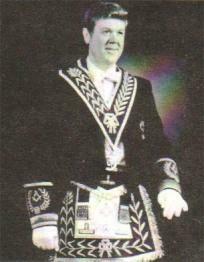 654 in 1960, serving as Master in 1968 and is a 32nd degree Mason. An elder of St. Mark's United Church, Dundas, he attributes his success to perserverance, commitment and a super wife. His hobbies are gardening, travel, curling and reading newspapers. His favourite quotation is "The great distinguishing characteristic of a Mason is love, expressing itself through Brotherhood."